In recognition of National Lighthouse Day, on Saturday, August 10, 2019 we will offer a tour of our Lantern Room and its 3rd order Fresnel lens. On the seventh of August in 1789 Congress approved an act that provided for the creation and support of lighthouse. 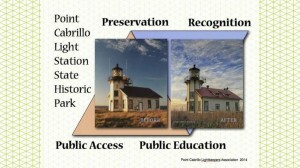 The Lighthouse at Point Cabrillo continues to be an official federal aid to navigation.